AUBURN — Marilyn E. Plue, age 86, died on Friday, September 21 in her home in Auburn after a lengthy and feisty battle with Alzheimer’s. She would have celebrated her 87th birthday on October 2. Marilyn is survived by her ‘senior companion’ Robert LeClaire of Sutton, and her caretakers Stephen & Joy LeClaire, also of Sutton. She is preceded in death by her husband, Bradford B. Plue. Neither Brad nor Marilyn had siblings, and the couple had no children. Marilyn was born on October 2, 1931 in Auburn to parents Cecil A. Trotter and Clara L. Schrunke. She graduated from Auburn High School and Salter Secretarial School in Worcester with a degree in business. She started her career working for the Auburn/Sutton School Department before accepting a position as a Secretary to the Treasurer of Johnson Steel and Wire in Worcester. 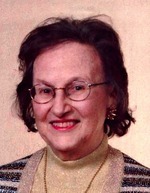 She later worked for Motors Insurance Company for 15 years, became President of Banner Personnel Consultants, worked as a Trust Administrator at Bowditch & Dewey Attorneys at Law, and finally for 25 years at Paul Revere Insurance Group, starting as the Supervisor of Employment and retired as Second Vice President and Assistant Treasurer, all in the Worcester Office. Marilyn was fond of saying that she was a force in the workplace before there were women in the workplace. Marilyn was a social, active woman who was deeply involved on several boards for the majority of her life. Amongst these were: As Officer and Director of VNA Care Network, President of VNA Worcester, VNA Advantage Board, Member of the Board and formerly Chairman of the Board of Family Services of Central Mass., UMASS/Memorial Hospital Board, Colony Retirement Homes Board, Member of the Board of Central Mass Health Care and the Health Foundation, Corporator of Peoples Savings Bank and Corporator of Private Industry Counsel, V.P. of OIC, V.P. of Soroptimist. She was also active in American Business Association, President of the Worcester Charter Chapter and V.P. of Minute Chapter. She received honors of Boss of the Year and Woman of the Year. In their spare time, Marilyn and Brad were members of Tower Hill Botanical Garden, Worcester Art Museum, Museum of Fine Arts in Boston, New England Historical and Genealogical Society, and Who’s Who of American Women. Together they enjoyed many fine trips to France, Panama and beyond. She enjoyed photography, fine cooking and dining, gardening and spending time with her friends and business associates. Marilyn was a kind person who gave generously to many charities. Calling hours will be Wednesday, September 26 from 9-11 a.m. with prayer service at 11 a.m. at the Britton-Wallace Funeral Home, 91 Central Street, Auburn. All are welcome to attend and celebrate Marilyn’s life. Burial will follow in Hillside Cemetery, Auburn. The LeClaire family would like to thank the wonderful staff from Elderwood Home Care of Sutton, and the Notre Dame Hospice of Worcester. In lieu of flowers, donations can be sent to the charities of one’s choice.